@mlyle doing up his Nano goblin has given me the itch. Finally going to throw one of the the DTFcs into this plank. Been dragging my feet on this, but finally found my missing DTFcs and have everything wired up for easy insertion into any of my planes. This should blow AS3X away at a fraction of the cost. Power rail on the DTFc PWM outputs is not connected to 5V by default. 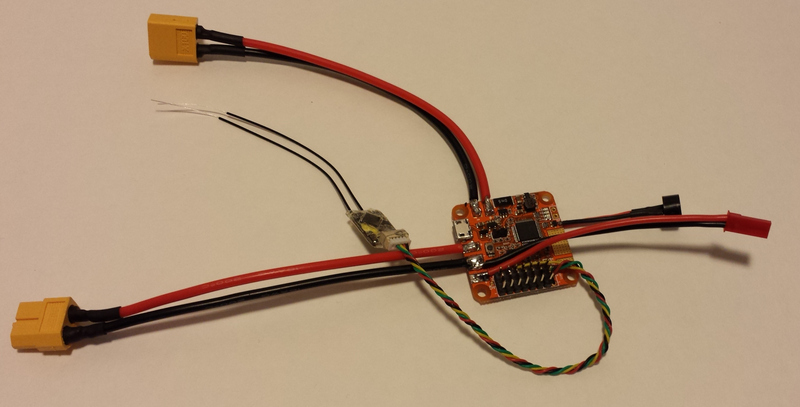 Power from ESC will be feeding the power to the servos through the DTFC PWM power rail. Just need to finish drawing up a case for the FC and 3D print it. FINALLY got the Goblin out to the field two nights this week and maiden flight. Had a hard, OK Impossible, time getting it in the air. Had I done a proper pre-flight, I would have noticed that the Roll and Pitch axis were swapped. This was not due to Input config, but rather the left servo needed to be reversed. Thought that had been done and saved a while ago, but appears it didn't save. D'OH. Didn't damage the the goblin one bit. This is one tough puppy. Did manage to knock the lens and holder off the AIO camera/vtx so was unable to do any FPV the first night. Did fix the servo issue and got a quick LOS flight in. Tried to repair the Camera, but unfortunately the sensor must have been damaged as well since it's just black... :-( Threw a different one on and got it out to the field the following night. Managed to get 3-4 flights, of about 40 minutes of total flight time, in full manual control, out of one charge with 30% left on the pack. Got roll and pitch trims set and then adjusted on the inputs tab of GCS. Ready to start playing with Acro/Rate mode next time out. Did some gliding from a few 100' up at 0 throttle, which then I realized that 0 throttle disarm was still enabled at 30 seconds when trying to feed power in close to the ground. D'OH again!. Managed to do a controlled ditch in the high grass at the end of the field. Need to add a beeper, which might have made recovery a tad bit shorter. Weather was not all that great today which gave me time to update to the latest next, fix the 0 throttle disarm, and bump rates up. Looking forward to next trip to the field. Will test rate mode and work on setting up leveling as well.